Use the 100 beautifully written 20th birthday wishes on this page via Facebook, Twitter, Instagram, Snapchat or text. Whatever you choose, you'll make the 20th birthday of your loved ones all the more amazing. 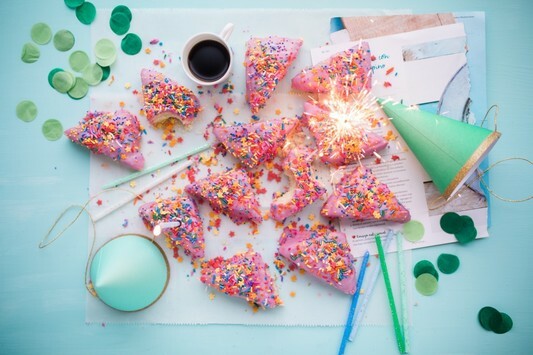 Turning 20 may not be as exciting as reaching 18 or 21 but it's still a major milestone, marking the end of the teen years and the start of the 20-somethings. This calls for birthday messages that give this occasion the blowout it deserves, like the ones below. Sure, if you go the "generic" route, it's pretty simple. 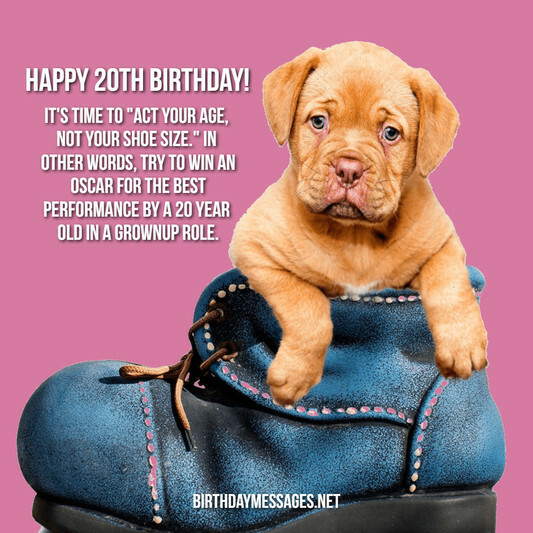 If you would like to be a little more personal with your birthday greetings, you may want to factor the importance of turning 20 into your ultimate choice. They are no longer teenagers, an undeniable fact for kids typically (and blissfully) in denial about the passage of time. They go through a mini "mid-life crisis" when they turn 20 (maybe even before). Some of them take this time to plan out what they would like to do with the rest of their life. They may be 20 years old but still have another 12 months before they can drink (legally). They can no longer throw caution to the wind and blame their troubles on their "crazy teens" (that time is gone for good). People take them seriously now, so they need to be more responsible. They need to start thinking about saving money for the future (and they know it, despite their repeated denials). Their 20s are the perfect time to start paying closer attention to their personal health (they aren't, as the saying goes, getting any younger). Their 20s are also a good time to focus on their mental health (especially if they do not live with their parents anymore). They may not be technically a teen any longer, and may not have the energy of a teen anymore, but their (younger) friends may still see them as the same vibrant, full-of-energy young person they were the day before their 20th birthday. They still have a decade before they turn 30 years old and actually go through their real mid-life crisis. They've seen the sitcom, Friends, which rightly or wrongly (depending on your experience) depicts “20-something” as the best years of one's life. They no longer get free stuff (in other words, birthday gifts) from every friend or relative. They are much less likely to have a major hangover the morning after turning 20 than the morning after reaching 21. Their parents can blissfully pretend for the next 12 months (the time before their kids turn the legal drinking age of 21) that they’ve never taken a sip of anything but water, milk or orange juice (without vodka, of course). No matter how old they get, they still believe wholeheartedly that their birthdays are special (particularly at 20). Everybody should still treat them like a queen or king for the day on their birthday (even at 20...or, for that matter, at any age). They can be certain that the social media world, in the form of many unoriginal happy birthday wishes, will still revolve around them on their birthday (even at 20...and 30, 40, 50, 60, you get the picture). Calories still don’t count on your birthday (especially when they turn 20, when they still have the metabolism of a teen). Their birthday cake should be at least a few inches bigger than the one they got the previous year to accommodate the 20th birthday candle (and celebrate this momentous occasion). All 20 of these facts may not apply to the birthday girl or boy but more than a few will be a roadmap to the best 20th birthday wishes, offering you the opportunity to make someone special in your life feel amazing on their special day. Now that's what I call a beautiful gift. *This list is based on these articles: 20 Great Things About Turning 20 and 5 Things You Can (and Should) Do for Your 20-Year-Old Self. First, let's start with the more serious, more sincere 20th birthday wishes for the birthday girl or boy in your life turning 20 today! Below, you can find funny 20th birthday wishes (right here, in fact). May your twenty-somethings and the rest of your days be blessed with all the things you love in life, bestowing you with amazing happiness, health and peace of mind. Happy 20th birthday. Happy 20th birthday! May your 20th live up to all your expectations...and then some. It's hard to believe you're already in your 20s. I hope the next 10 years turn out to be the best decade in your lifetime. Happy 20th birthday! May you only know greater joy and greater peace of mind as you navigate the twenty-somethings. Happy 20th birthday! Happy 20th birthday! I wish you only the best that life and love have to offer on this milestone of a day, your 20th birthday. Happy birthday! May you enjoy at the very least 20 incredible blessings on your 20th birthday, starting with happiness, health and prosperity. Happy 20th birthday! You've already done so much with your life. I truly cannot wait to see all the great things you'll accomplish the rest of your life. Happy 20th birthday! 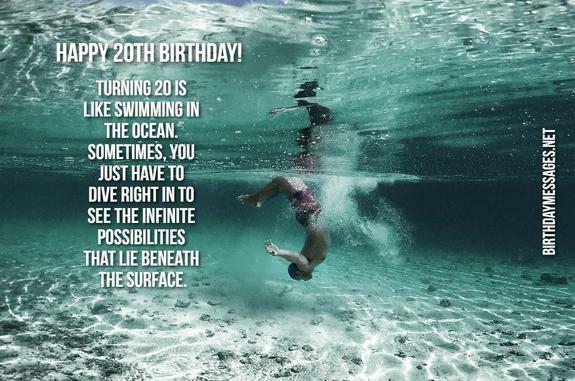 Turning 20 is like swimming in the ocean. Sometimes, you have to just dive right in to see the infinite possibilities that lie beneath the surface. Happy 20th birthday to my favorite person in the world (who is turning 20 today). You are an amazing individual, no matter how you are (just saying). It's a pleasure and honor to wish you the happiest of birthdays, your 20th birthday! I do not want you to have a happy birthday. I would love for you to have the best 20th birthday ever, greater than any other 20th birthday in history! Have an amazing, incredible, marvelous, outstanding, thrilling and mind-blowing 20th birthday! Happy birthday! Welcome to one of the best decades of your life - the twenty-somethings! Happy 20th birthday! Today, nobody could blame you for forgetting to figure out what to do or be for the rest of your life, but you're definitely on the right path! Power to you! Happy 20th birthday! I've heard it said that life begins at 40. You may only be halfway there, but nothing is stopping you from enjoying your life to the fullest, starting today! Happy 20th birthday! 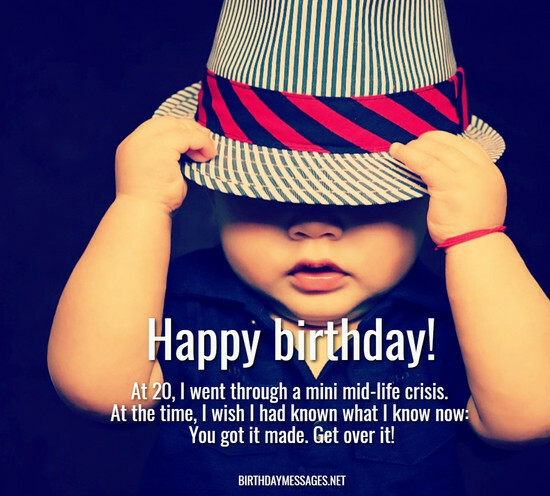 Hope the next decade — your 20s — will be as incredible as your last two decades! Happy 20th birthday! As far as I'm concerned, you don't look a day older than 19, even though you are. As Billy Crystal once said, "you look mahhhvelous! Happy 20th birthday! Congrats! You survived the teens. Now it's time to thrive in your 20s. Happy 20th birthday! Time's up! You have to become a grownup now! It's not all bad — you also get to enjoy all the privileges that come with the twenty-somethings (too many to mention here). Now that's something to celebrate. Happy 20th birthday! Now you can't blame all your troubles on your "teens" anymore. You aren't a teenager any longer. Besides, you can't do the really stupid things we all do — you have another year before you can drink and make a fool out of yourself. Happy 20th birthday! Kiss your teens goodbye and say hello to your 20s...and all the good times in store for you. I actually envy you (in the best of ways, of course). May you enjoy each and every moment of this special day, your 20th birthday. You deserve it. Now tell yourself that and celebrate! Happy 20th birthday! You deserve the good life. Now go out and earn it, like I know you can do in your uniquely beautiful way. Happy 20th birthday! May you always enjoy the best of everything life has to offer, starting today. Happy 20th birthday! You're now old enough to know better, and that's a good thing. It means that you will never miss the great things in life. Enjoy every second! Happy 20th birthday! Before the responsibilities of being a grownup start to mount, take a breather and enjoy everything the 20s and youth have to offer you. You'll thank me later in life. Happy 20th birthday! Enjoy the present. The future can wait, today of all days. Wishing you a long life full of love, happiness and, most of all, peace of mind. Remember, youth is not something to take for granted. Live it up, but be responsible. Also, be accountable, so people will count on you the rest of your life, trusting you with theirs. There's nothing quite like it. Life truly begins at 20, because you become a grownup who can celebrate every living moment and make the earth a better, gentler place. I know you can do it like no other. Yes, your 20s are the start of your grownup years but don't forget to follow your bliss along the way. You don't want to forget your dreams — they are what drive us to greatness. You are destined to be great. Dream away, starting today! I'm so proud of you...and you're only turning 20. Just think what you can do with the rest of your life. You are and will be incredible! When I turned 20 years old, I went through a mini mid-life crisis. At the time, I wish I had known what I know now: You got it made. Get over it! 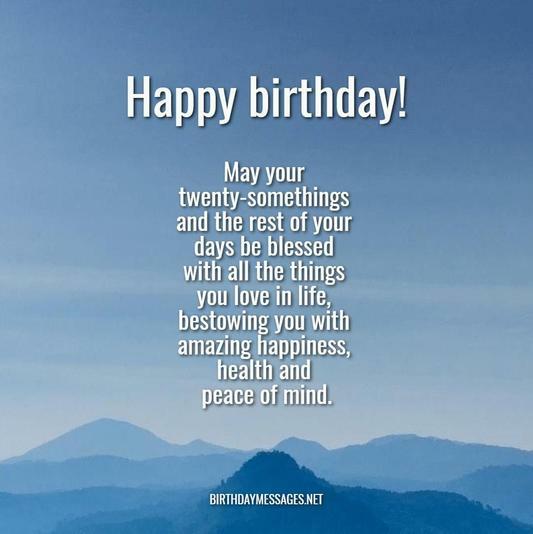 Have an amazing 20th birthday! Happy 20th birthday! Turning 20 isn't all bad. There's definitely one thing going for it: since you can't drink (legally) for another year, you may actually remember your 20th birthday celebration. Happy 20th birthday! Remember, you can't drink until you turn 21, so you'll have to stand tall (or, at least, stand up) for this year's birthday celebration. Happy 20th birthday! You're not getting older. Actually, you're not getting wiser either. At least, you're done with zits. Happy 20th birthday! I wouldn't say you're getting old. Of course, if you live to be 80 year old, you've already used up a quarter of your lifetime. Happy 20th birthday! I wouldn't call you old, but you are nearly at the point where another birthday is not necessarily a good thing anymore. This birthday is not all bad. Sure, you can't drink legally yet, but you can still get your parents to do your laundry and cook you supper. Happy 20th birthday! Turning 20 is like waking up with nothing to do and nowhere to go. Hey, it's just like being a teenager. Happy 20th birthday! Happy 20th birthday! Congratulations, you survived the teen years. Too bad! That means you didn't have any real fun. Time to make up for lost time! Happy 20th birthday. You're now at the age when your friends and family will tell you "your 20s will be the best years of your life," when you know, for a fact, you'll be eating uncooked ramen noodles over the kitchen sink for the third day in a row. Now that you're 20 years old, I can only assume that you will still be as cool as ever. But you know what they say when you assume. Happy 20th birthday! You now have two very good reasons to be older and wiser. You're not a teenager any longer and you're not old enough to drink (legally) yet. Happy 20th birthday! Happy 20th birthday. Don't you think that you make 20 look so cool? Neither do I. Did you hear that whooshing sound? That's the sound of your childhood (I mean, teens) going down the drain. Happy 20th birthday. This is the perfect time to be 20. Everybody younger than you still thinks you’re cool and everyone older than you is envious of your life. Happy 20th birthday! Now, everybody will be obliged to tell you to "act your age, not your shoe size." In other words, try to win an Oscar for the best performance by a 20 year old in a grownup role. Happy 20th birthday. Lucky you, you're now at an age when you can use “I’m trying to find myself” as an excuse for just about anything. Did you hear that popping sound? That's the sound of your last zit ricocheting off your mirror. Happy 20th birthday. I can think of one very good reason for turning 20. It's one year away from drinking legally. Happy 20th birthday. Happy 20th birthday. You're now at an age when you can still take a long leave of absence from work to “travel” and your loved ones will actually applaud you for it. Happy 20th birthday. You're now at an age when you have to be independent and ask yourself, "Can anyone see my black sequin bra through my white shirt?" and other "earth-shattering" decisions. Turning 20 has its good and bad points. It's good because you're one year away from drinking legally. It's bad because, well, you're one year away from drinking legally. Happy 20th birthday. Happy 20th birthday! You've reached the perfect decade for experimenting with anything, everything and anybody, so you can figure out in your 30s why you wanted to do so many stupid things in your 20s. Happy 20th birthday! You're about to spend nearly 100% of the next decade screaming "WHAAAAAT?" in loud bars, in search of Mr. or Ms. Right or Wrong. It’s about time that one of us turned 20! I'm so glad that you were the first to reach this milestone! Happy 20th birthday! Don’t let turning 20 years old discourage you from acting like a grownup. You've always been a very good actor. Happy 20th birthday! Don’t let turning 20 years old discourage you from acting like an idiot. You've always been very good at it. Happy 20th birthday! Happy 20th birthday. Now that you're 20, you need to follow 10 very important rules every 20 year old should adopt: turn 21, turn 22, turn 23, turn 24, turn 25, turn 26, turn 28, turn 29 and turn 30. After that, according to people in their 20s, it really doesn't matter what you do with your life. Did you hear that popping sound? That's the sound of your pants splitting. Yep, gone are the glory days of eating anything and everything, without ending up with a tire around your waist. Happy 20th birthday. Did you know that turning 20 makes men act their age? Yeah, 10 years old. Happy 20th birthday. At 20, 2% of women start to lie about their age (98% have always lied about theirs). Happy 20th birthday. 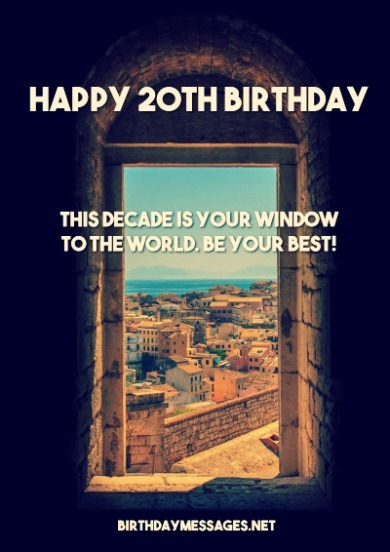 This decade is your window. Be your best, my darling child. Happy 20th birthday! Happy 20th birthday, my precious [son or daughter] . Today, you enter an all-new decade — your 20s. Make it epic! Happy 20th birthday to you, my darling [son or daughter]. You only deserve the best of days. Happy 20th birthday to you, my beautiful [son or daughter]. This day is all about you! Happy 20th birthday. For 20 wonderful years, you’ve made our lives an amazing adventure. May yours always be so blessed. Happy 20th birthday. May your sweet heart and soul always know true happiness. Happy 20th birthday. Celebrate life like you don't have a care in the world. Love like you do. Happy 20th birthday. Here’s to more mistakes, more lessons and, most of all, more adventures. Happy 20th birthday, [son or daughter]! I'm so proud of you. I can't wait to see what you do next. Happy 20th birthday, my wonderful [son or daughter]. You make me so proud. But I know the best is yet to come. There's so much I want to say to you, so you will start your 20s on the right foot. But you always land on your feet, no matter what comes your way, so I don't have to tell you a thing, except "Happy Birthday," my precious child. You are my sun, my moon, my everything. I think the world of you. Happy 20th birthday, sweet child of mine. Happy 20th birthday! 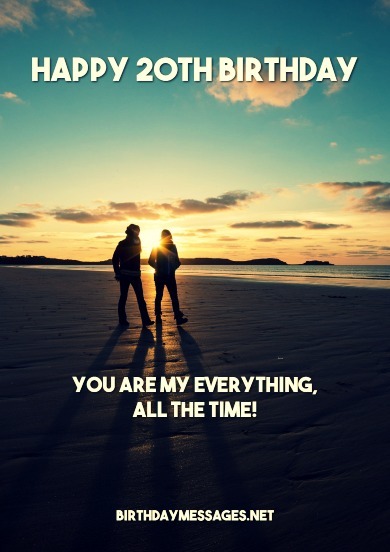 You are my everything, all the time! Happy birthday to the sweetest 20 year old I know and love. Yes, that's you. Happy birthday to the loveliest 20 year old my eyes have ever seen. Yep, you! Happy 20th birthday, darling! This is me kissing and hugging you. I love you. Happy 20th birthday to the world's most beautiful [woman or man]. I love you. Happy 20th birthday to the world's [handsomest man or prettiest woman]. I'm the luckiest person in the world. Happy 20th birthday to the most important [man or woman] in my life! Darling, I love you. Wishing you, my dearest, my love, the happiest 20th birthday ever! Happy 20th birthday to the sweetest honey of all! You are my dream come true, my best friend, my lover. I always want to be with you. Happy 20th birthday, my darling, my love. You are the only true love of my life. Happy 20th birthday, my truest love, my truest passion and my truest friend. In my world, you're the most incredible [girlfriend or boyfriend] in the universe. May your 20th birthday be as truly, madly and deeply lovable as you are, my sweetheart! Happy 20th birthday! Your twentysomethings will be the best of times. 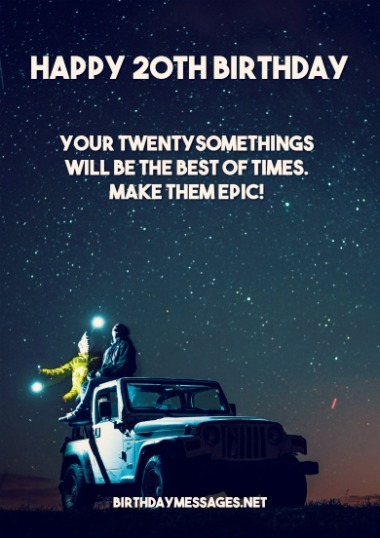 Make them epic! My dearest friend, you're a success story in the making. Thanks for making me a major plot point in the movie of your life. Happy 20th birthday! Happy 20th birthday, my devoted friend. May you only know true joy, peace and achievement in your 20s and beyond. Happy 20th birthday, buddy pal! Congrats on surviving your teens. May you follow your bliss everywhere and anywhere you go. Happy 20th birthday, my best pal. Never play it cool. You don't have to. You rule. Happy birthday! Wishing you all the best things this world can give you in your 20s and your 30s, 40s, 50s, 60s, 70s, 80s, 90s, even your 100s. Happy 20th birthday! Hoping this extraordinarily special day of yours makes you feel just as special (because you are to me). Happy 20th birthday. You're not one of my best friends. You are my very best. May your 20s be the best ever for you. Happy 20th birthday to my BFF. You're the best in so,so many ways. May the next decade be the best of times for you. For your 20th birthday, the only words I would like to send your way are these: you are my best pal. Let's stay the best of friends forever! Happy, happy 20th birthday to my incredible friend and an even more incredible 20 year old! Happy 20th birthday, my truest BFF. May every moment of your 20s be as amazing as our friendship! Wishing you, my best friend, an unforgettable birthday and most of all, an even more unforgettable decade full of happy birthdays.